In the almost 8 years we have been open, we have been fortunate to have trained over a dozen women through their pregnancy and post-delivery recovery. We caught up with the women from our most recent baby boom to discuss their experiences training while pregnant. How did/has CrossFit help your pregnancy/delivery? I believe CrossFit truly made all the difference in the world for both my pregnancy and delivery!! I was very lucky to have a healthy pregnancy and really didn't gain too much weight. I contribute that to both nutrition, although I did eat foods I hadn't eaten in years, and working out. I also think it helped that I had been doing CrossFit for about one year prior to getting pregnant. I think that gave me a good base of muscle to start my pregnancy off with. In regards to my delivery, my OB commented that they thought my delivery would go fast because I was in good shape. She was definitely right! I only pushed a handful of times, less than 30 minutes, before my son was born. What were the biggest concerns you had while working out during your pregnancy? My water breaking during a class in the gym! On a serious note, I was never worried about injuring myself or doing anything that was unsafe while working out because the coaching at our gym is amazing. The coaches were always very supportive and we're constantly reminding me to just move and not worry about the intensity like I normally would. What has been the biggest challenge returning to CrossFit? Being patient with myself and understanding that it would take time and hard work to get back to where I was pre-pregnancy. How many months postpartum are you? 12 months postpartum with child #2. I have 2 children, ages 3 and 1. I CrossFitted during both pregnancies, thankfully! Was the coaching and movement modifications helpful? Absolutely! 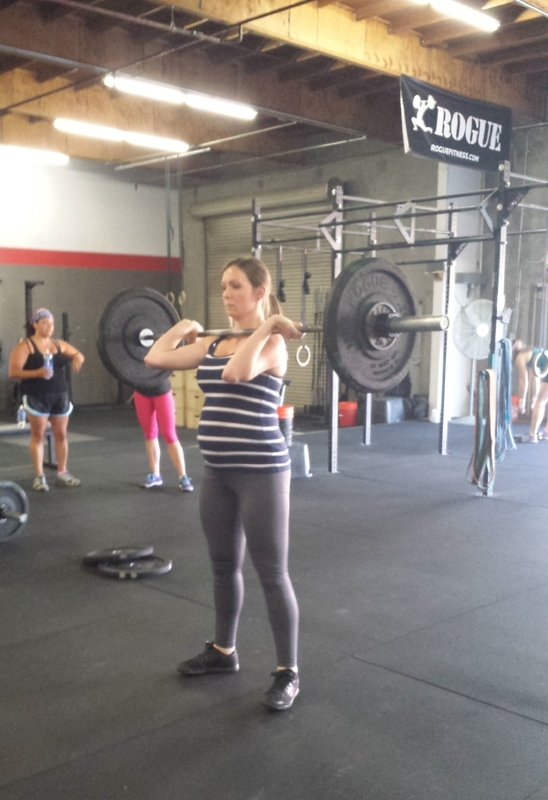 I love that CrossFit is not a one size fits all approach in general and even more so while pregnant. At the time I was pregnant with my first child, there were 6 other pregnant women at our gym. The coaches were fantastic at helping me find a weight/movement that felt the most comfortable for each WOD. When I got pregnant the second time, they were equally as great at helping me find an appropriate scale. Any tips or words of advice for other pregnant women or new moms? Trust your body, listen to your body and know that everything can be scaled. 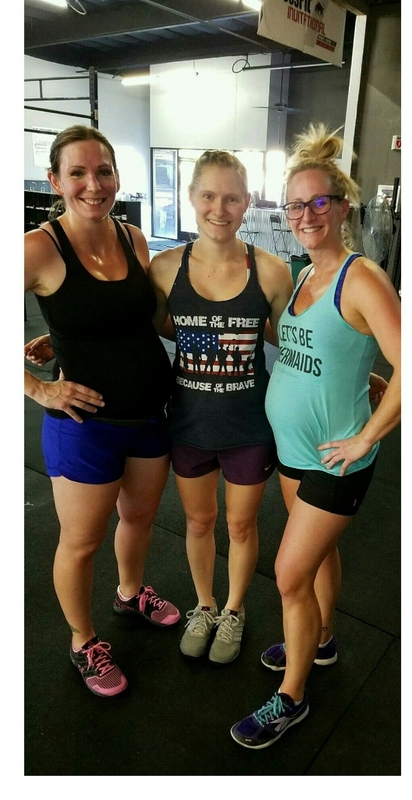 Please know that all of us Moms are inspired by each other and we fully support you in your journey to CrossFit while pregnant and postpartum. You are a Rockstar! Was there a difference between pregnancies where you did CrossFit versus non-CrossFit? My first pregnancy I worked outside the home and was mostly sitting for my job. I had pretty bad back pain, and I gained a lot of weight, 55 lbs! With my 3rd pregnancy I had zero pain of any kind and didn't gain as much weight. I didn't think that I could actually lift such heavy weights while pregnant. In my eastern European culture, pregnant women are supposed to be these fragile creatures that aren't allowed to do anything. I was scared that I might pull something or something might rip or I'll drop something on my stomach or bump it. These concerns or fears sound silly to me now because I never actually felt in danger at any point. First I had to recover from c-section. I also had to figure out my new schedule with 3 kids and a husband who also joined the gym. We had to and still sometimes struggle to figure out how to make everything work. Lots of communication with my husband. One of us always needs to be with the kids. We take turns. But some weeks Andrey doesn't make it home in time for me to go. For pregnant women, there is nothing that you can't do. There is a modification for everything and you are stronger than you think. New Moms, don't be so hard on yourself. Give yourself grace. If you cant make it to the gym today or this week that's ok, make it in when you can. There is always tomorrow and next week. But always try to go, trust me, you need the sanity break. I had an easy pregnancy and I attribute that to CrossFit. I didn’t have all of the complaints other women had about being pregnant. I was in a pregnancy mommy group and I felt I had less to complain about than others. During labor I was induced 10 days early, so pre-labor was really stressful/long. 2.5 days, but she it came time to push, it literally took me 3 pushes to get him out! Like 2 mins! That’s CrossFit baby! I am a strong girl and I really think it helped! Time and working around his feed/sleep schedule. I have been attending noon classes because it’s his nap time, but it is sometimes hit or miss as to whether he’s going to let me work out that day. I also would sometimes rather nap with him instead of working out, so I am less motivated to go. Just telling myself that it makes me feel better. I remember how good working out makes me feel and usually can get myself motivated to go! I had my first child 9.5 months ago. I had already been doing CrossFit for 4 years when I got pregnant, so I just continued working out. My midwife was very supportive of this as there are so many benefits to both mom and baby. 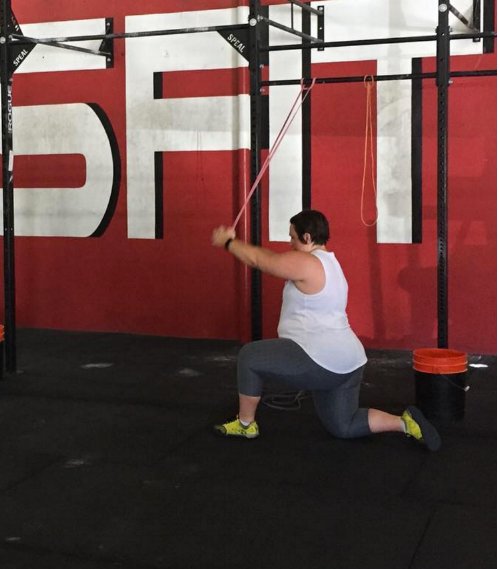 CrossFit helped me mentally stay sane throughout my pregnancy and helped me stay active. I would like to say CrossFit helped me during labor, but there aren't any exercises I know of that help strengthen the uterus. I was in labor for just about 24 hours and my body has never worked so hard to do anything before. CrossFit did help me keep my strength up during labor, but there really isn't any comparison to labor. My advice to pregnant ladies and new mamas is to keep coming in, even if it's hard. Staying active helps with so much in pregnancy. It doesn't matter how much you scale, it just matters that you show up. Listen to your body since you know it best. If something doesn't feel right, don't do it. When you're postpartum, take the time you need to heal. Also, wear a pad during jump rope days since you will pee yourself! My last bit of advice is to surround yourself with a village that will support you through it all. I definitely couldn't do it without my village of CrossFit SAC friends!